Academy Award Winner Cuba Gooding Jr. and Academy Award Nominee Terrence Howard lead a powerful ensemble cast in this high-flying epic inspired by the real-life adventures of the first African-American combat unit to serve in World War II. Italy, 1944. As the war takes its toll on Allied forces in Europe, a squadron of black pilots known as the Tuskegee Airmen are finally given the chance to prove themselves in the sky...even as they battle discrimination on the ground. 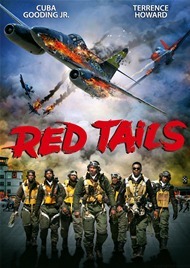 Featuring jaw-dropping aerial action and thrilling special effects, Red Tails is a breathtaking tribute to the unsung heroes who rose above extraordinary challenges and ultimately soared into history.